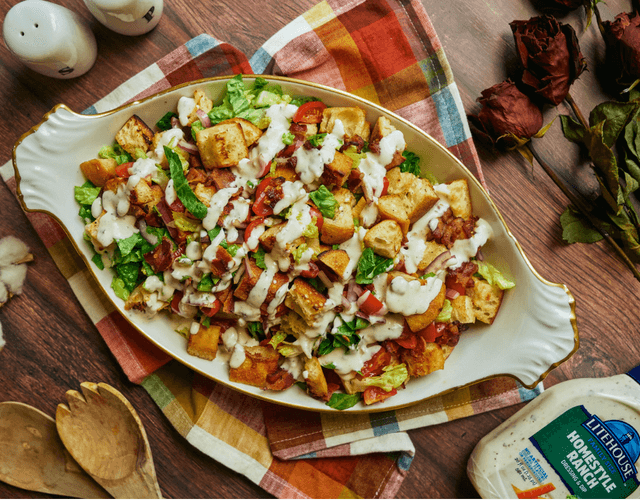 Panzanella already sounds fancy enough but topping it off with Litehouse™ Homestyle Ranch Dressing & Dip turns this Tuscan chopped salad of bread, tomatoes, bacon, onion, and lettuce into the bell of the ball. Toppings accessorize food! They can make any meal transform from drab to fab in one squeeze, dash, or spread. That’s why Litehouse™ wants to excite you about dressing your meals as much so as styling an outfit. 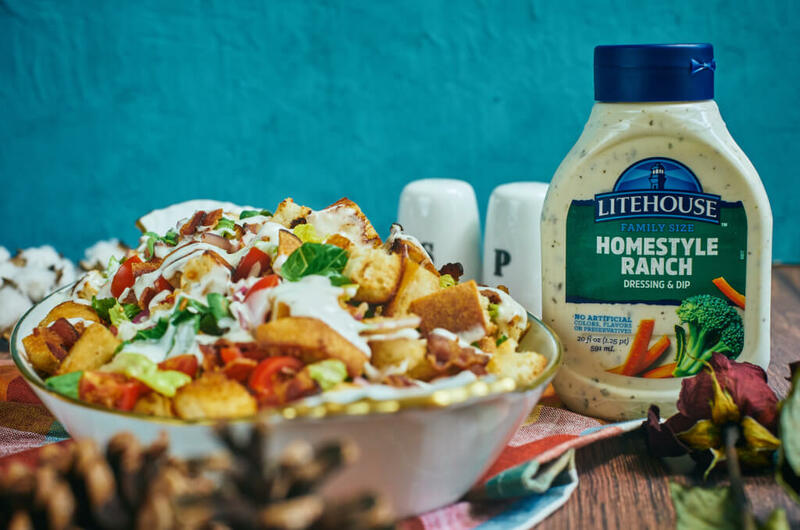 Their famous Homestyle Ranch is a delicious combination of fresh herb and vegetable flavors married together. A traditional favorite that's sure to please your family, a perfect completion to your snack, lunch, or dinner plate, thanks to no artificial colors, flavors, or preservatives. Litehouse™ products of joy have been shared across generations of family tables for over 50 years. That’s 50 years of flavor, quality ingredients, and culinary creativity. 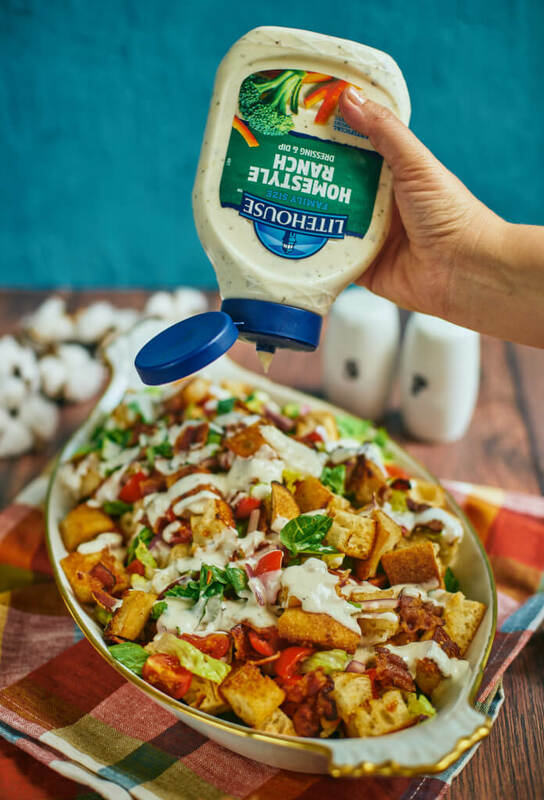 How you top it off is up to you, just make sure to get some ranch in every bite! TIP: Before slicing into cubes, rub the baguette with a garlic clove (cut in half) for a little extra flavor. 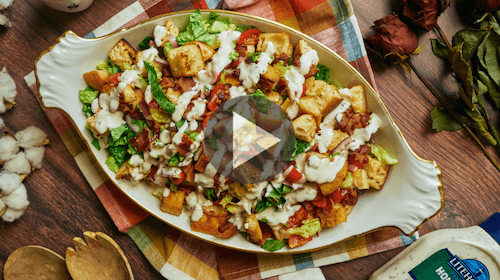 In a large skillet, cook bacon to your desired doneness (we think crispy works best in this salad). Remove bacon from skillet and reserve drippings. Add sliced bread to skillet and toss to coat. Cook bread in bacon drippings stirring frequently until bread is crispy on the outside and warm. Remove from skillet and place into large serving dish. While the bread cooks, slice cherry tomatoes in half, thinly slice red onion or shallot and slice romaine lettuce into thin strips. 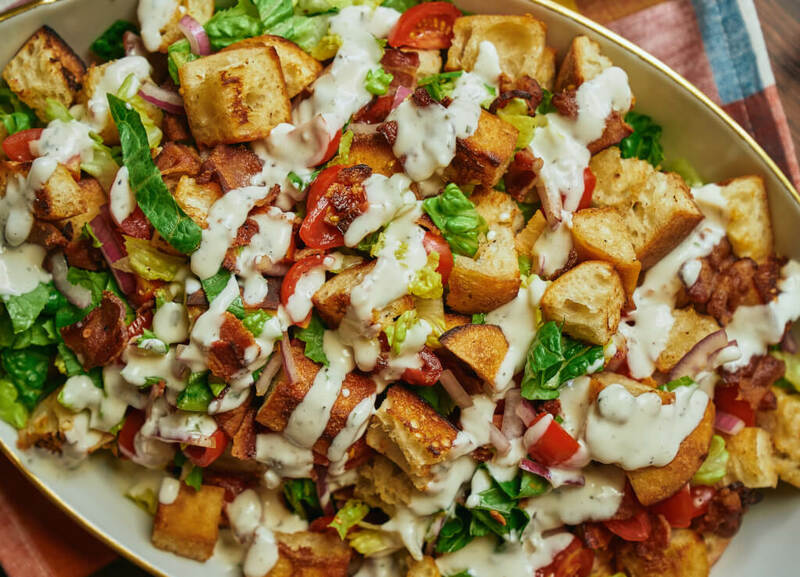 To the large serving dish with cooked bread add crumbled bacon, tomatoes, red onion, and romaine lettuce. Toss all ingredients to coat. Generously top it off with Litehouse Homestyle Ranch Dressing. Sprinkle with salt & fresh cracked pepper. If desired, add fresh parmesan cheese shavings. Enjoy!